Many Malibu residents were awakened on Sunday morning to the ominous rattling and shaking of an earthquake. The magnitude 3.32 temblor was centered in the Santa Monica Mountains on a fault under Latigo Canyon. That’s not surprising, because the mountain range’s dramatic beauty was sculpted out of the earth by seismic forces, and that process is far from over. The architect is still at work. Here's a closer look at the Topanga anticline, with the sandwich-like layers of up-ended sedimentary stone clearly visible. Malibu has two major earthquake faults: the Malibu Coast-Santa Monica Fault and the Point Dume Fault. The first runs east-west through the city, while the Dume fault, located just offshore, extends northward out toward the Channel Islands, which are actually the highest peaks in the submerged westernmost portion of the Santa Monica Mountains. 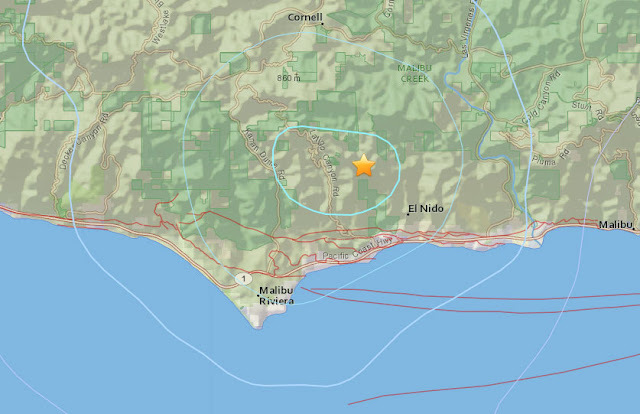 This is a USGS map showing the location of the October 25, 3.32 magnitude Malibu quake. The network of red lines indicates various local earthquake faults. The Santa Monica Mountains are a sort of sandwich tray that a careless giant dropped and hastily attempted to reassemble. 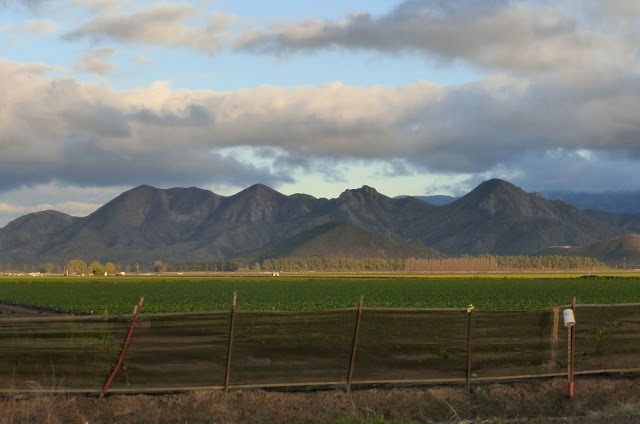 They are comprised of heavily faulted and folded ocean floor sediments, liberally interspersed not with mustard or ketchup, but with lava formations known as the Conejo Volcanics, and with a jumbled assortment of alluvial soils and landslide material to garnish the dish. The volcanic intrusions in the Kanan Dume area of the Santa Monica Mountains are visible for miles. 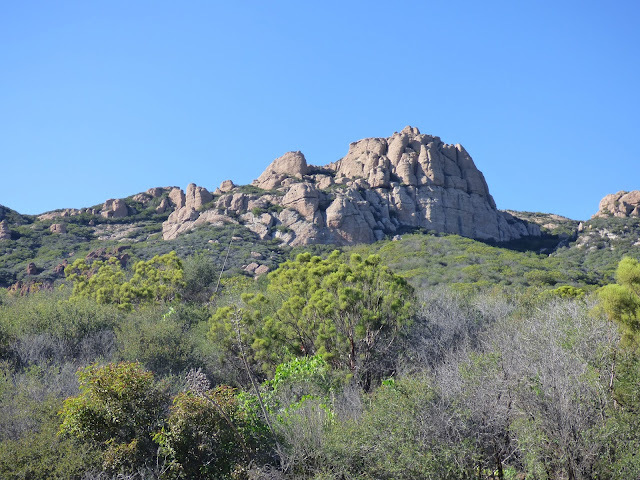 Saddle Rock, the one that looks like a giant hitchhiker's thumb, can be seen from the top of the Santa Susanna Mountains and was reportedly an important Chumash landmark. In many parts of the Santa Monica Mountains, Miocene-era shales and sandstone are full of marine fossils, lifted far above the ocean floor and left to weather on the mountain tops. 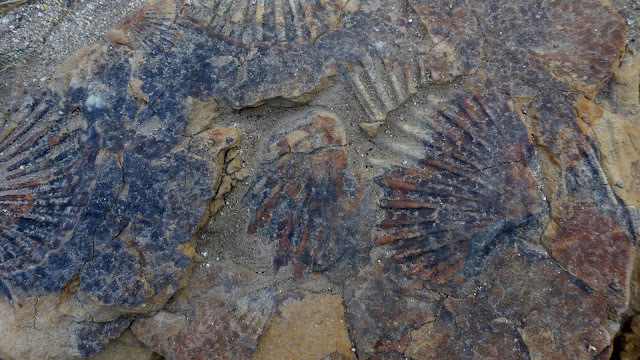 Fossilized sea shells like these scallops, or pecten, occur in the Topanga Formation—Miocene-era sea floor sediment that is common in the eastern Santa Monica Mountains. In other parts of the range, rain and wind have excavated spires and domes of lava, which emerge from the layers of sediment like massive sculptures. And all through the mountains erosion continues to carve canyons and reshape the land, while landslides rearrange the canyons and coastline. Sandstone Peak, the highest point in the Santa Monica Mountains at 3111 feet, technically ought to be called Andesite Peak. It's made of red stone that may resemble sandstone, but is actually volcanic, not sedimentary. Corral Canyons fantastic rock formations are made of soft sedimentary rock created from alluvial soils and twisted into bizarre shapes by the seismic activity. The caves were formed through a combination of erosion and wind action. Relative is the operative word. There are plenty of smaller faults—offshoots of the main faults in the same way that the main faults are generated by the San Andreas Fault, the massive boundary between the Pacific and North American plates, that have the potential to wreak havoc. 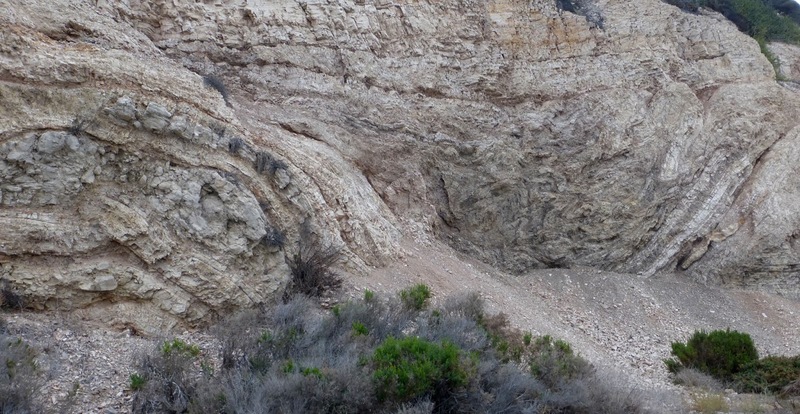 The bluffs at Point Dume preserve a record of violent seismic activity. 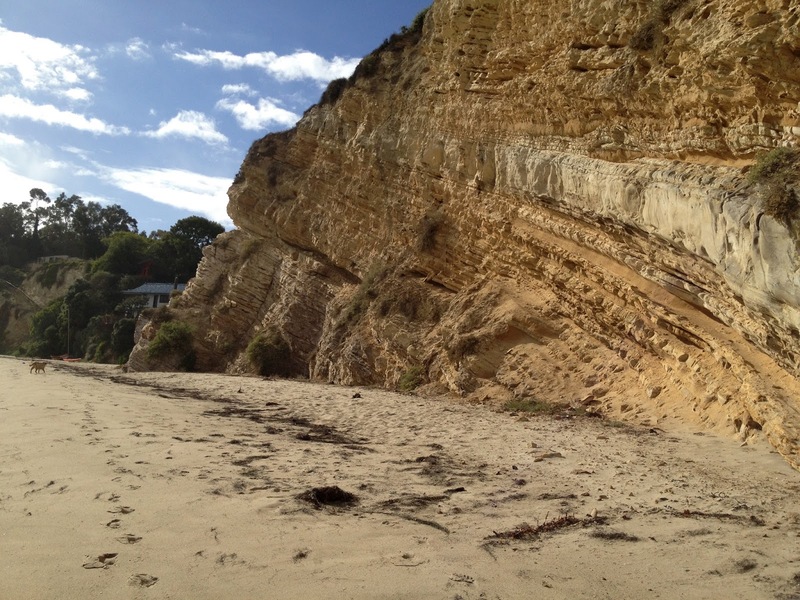 This cliff is made of layers of soft sea floor sediment that have been forced up at an angle. At Westward Beach, the sedimentary rock is folded and rolled—a sort of geologic burrito, rather than a sandwich. Clifftop homes perched on top of these cliffs may boast stellar views and command fabulous prices, but are at increased risk from earthquakes, landslides and even wave action, and are ultimately fairly impermanent in the scheme of things. The two main plates are what is called a strike-slip fault: the Pacific plate is moving north, taking most of Southern California with it, but it isn’t a smooth transition. The plates grind and catch as they move. Somewhere along the line the plates developed a massive kink, called the Big Bend. This geological phenomenon accounts for the shape of Southern California. It's why the Santa Monica Mountains form a transverse mountain range, running east-west, instead of north-south, and why Point Dume faces south instead of west, giving Malibu residents and visitors an unusual view of the sun rising and setting over the Pacific, and confusing travelers on Pacific Coast Highway—officially a north-south highway, but one that actually runs east-west. 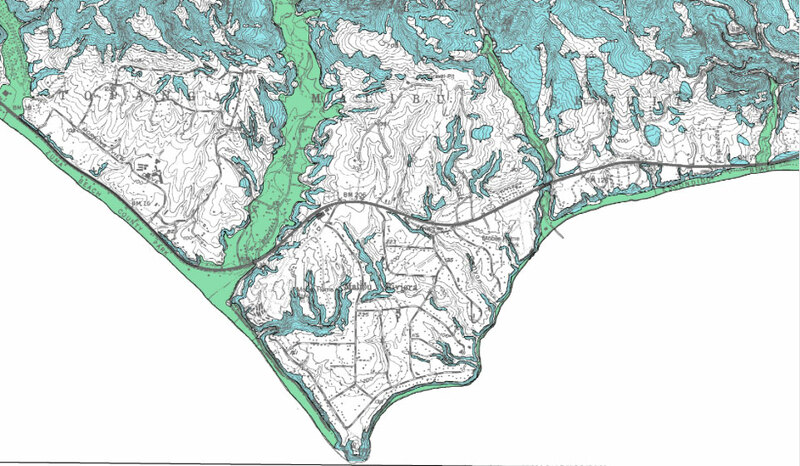 This old USGS map shows liquefaction risk (green) and landslide hazards (blue) in the Point Dume Quadrant. The Point itself is shaped by the Malibu Coast Fault. My dad used to to say that when you are standing on the top of the headlands and looking out to sea you are looking straight towards Antarctica, and there's nothing in between except water. The Big Bend also generates numerous smaller faults, including the Malibu faults, and the blind thrust fault that generated the 1994 Northridge Earthquake. 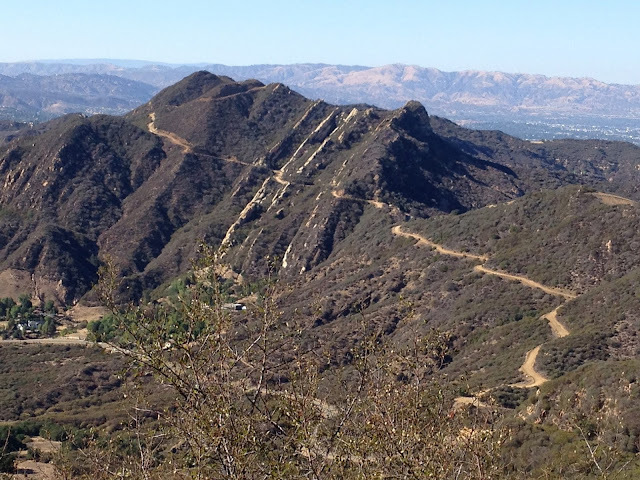 The National Park Service created this map of geology in the Santa Monica Mountains. Red represents Conejo volcanics, beige is the Topanga formation. The dotted line that runs through Point Dume is the Malibu Coast Fault. There are a couple of other major faults on the map that weren't discussed in the article, the Boney Mountain Fault, which is responsible for the most rugged and highest portion of the mountain range, is one of them. Here's a link to a version with higher resolution. While the media frequently warns about the “Big One,” a rupture of the main San Andreas Fault, which could potentially cause a catastrophic magnitude 8.2 earthquake, the smaller local faults, like the ones under Malibu, also have the potential to generate devastating earthquakes—up to a magnitude 7—more than enough to turn Malibu into a disaster zone. 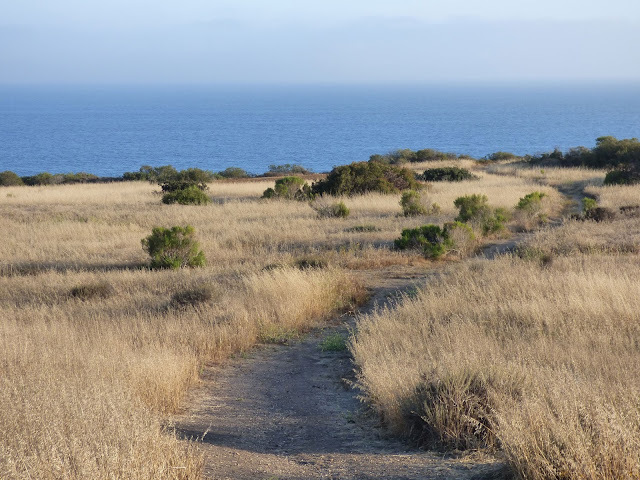 An earthquake fault is why Malibu Bluffs Park is open space and not an industrial development. In 1987, General Motors abandoned plans for a three-story 85,000-square-foot research facility not because the Coastal Commission and local activists objected to the loss of key recreational and environmental land but because an active fault was identified on the property. "Geologists have known of the main Malibu fault for many years," a May 10, 1990 Los Angeles Times article states. "But in the last few years, evidence has been found to indicate that it is active and more extensive than previously realized. Among the significant recent discoveries are two splays or splinter faults off the main Malibu fault that have been active within the last 11,000 years—the benchmark for what constitutes an "active" fault in California. The first discovery of an active splinter fault in 1987, forced General Motors Corp. to abandon plans for construction of an $11-million advanced design center across Pacific Coast Highway from Pepperdine University." Among the numerous "smaller" faults running through the area with that potential is the Elysian Park Fault, discovered in 1987 following the 5.9 Whittier quake. 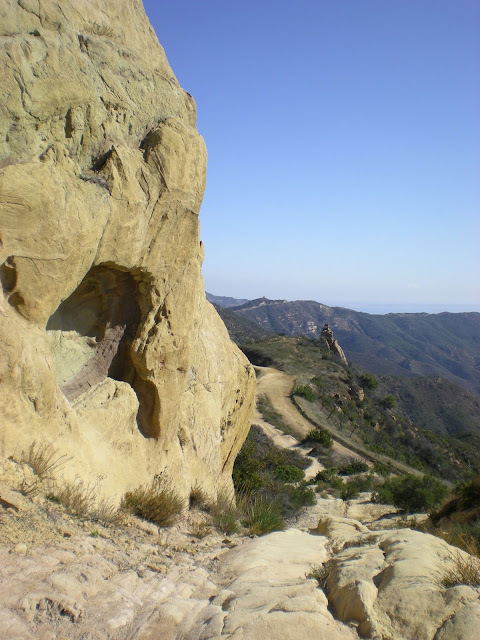 According to the Los Angeles Times, it is a blind thrust fault that extends all the way from Whittier, through Downtown Los Angeles, and out to Point Dume, without ever breaking the surface. The probability is high that there are still undiscovered faults of this type throughout the area. A significant earthquake is just a matter of time. 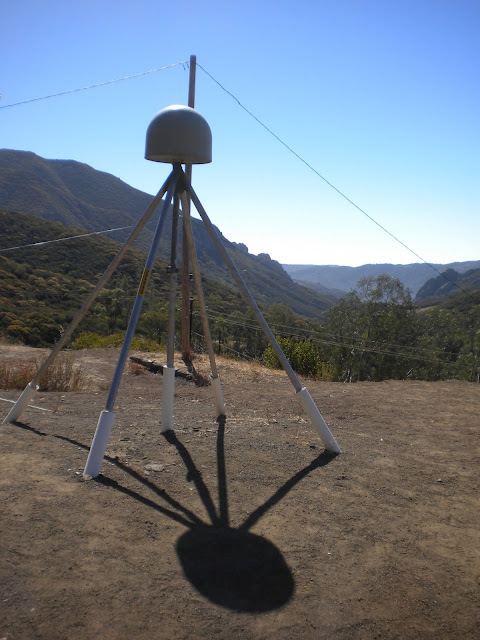 A seismic sensor monitors activity in the Santa Monica Mountains at the National Park Service's Circle X Ranch in the western Santa Monica Mountains. The City of Malibu offers a variety of emergency preparedness materials and classes, including CERT training for adults and teens and a family emergency preparedness workshop that covers essentials like first aid. Ready.gov, FEMA's emergency preparedness site, is another good place to start, and there hundreds of other websites out there devoted to everything from advice on securing furniture, to the best ways to store food and water. Having an emergency plan, and supplies that include food for humans and pets, water, medicines, flashlights, warm clothes, and a battery-powered radio can be the difference between an adventure and a fiasco. The October 25 earthquake made beds shake and shelves rattle, but was too small in magnitude do cause significant damage. Next time, we may not be that lucky. 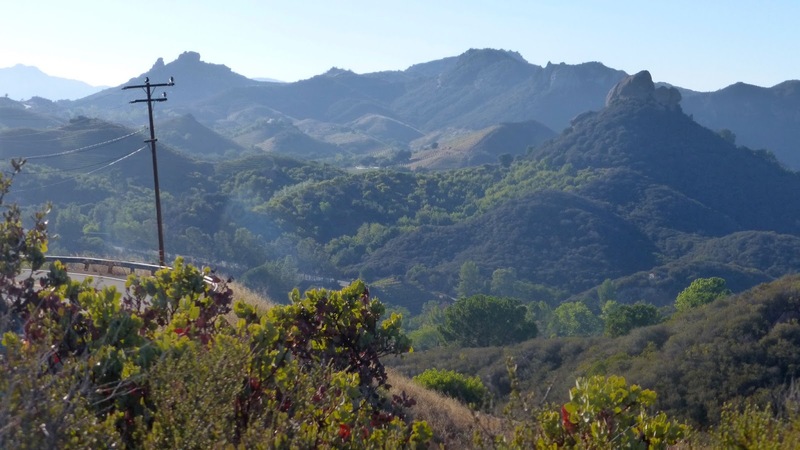 The Santa Monica Mountains rise abruptly and dramatically from the Camarillo Plain. They tell an epic and constantly evolving story of upheaval and change in which humans are only a footnote.